Postcards | The Designer's Desk, inc.
Postcard marketing is a powerful, affordable avenue earning the attention of thousands of members every day. Crowded email inboxes have made direct mail more effective than ever. 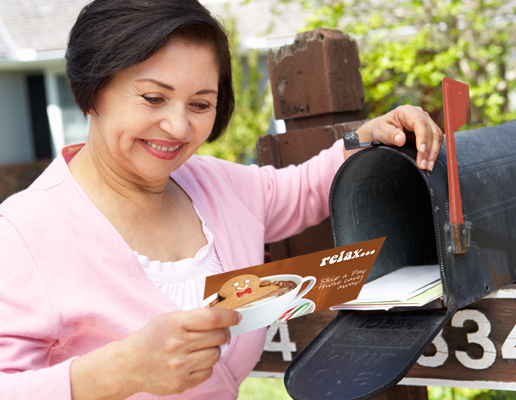 As a proven channel for building awareness, postcards enhance your brand. Recent tech and creative advances have improved response rates. They’re affordable and easy to create. Try one of our Gallery items or our DesignOnline tools. Timely reminders and save-the-date messaging increase traffic for events and loan sales. Niche mailings to targeted lists (i.e. addresses closest to your branch or member who don’t already have a debit card) can lower your postage costs. Sending recipients to a website landing page for further information simplifies tracking. Limit your message to one main message with light supporting copy. For the most effective response, do not include more than one call-to-action. For even higher response rates, offer a small giveaway. It does not have to break your budget. Tip sheets, financial guides and premiums are great ways to reward respondents.